The project was developed at the request of EU venture capitalist. The cost of launching spacecraft into orbit is still high. This is due to the high cost of rocket engines, expensive control system, expensive materials used in constrained designs of launch vehicles and their engines, complicated and usually expensive technology of their manufacturing, launch preparation and, mainly, their expendability. The share of launch vehicle cost in overall cost of spacecraft launch can be different. If the launch vehicle is produced serially and the spacecraft is unique, then this share is about 10%. If opposite, then it can reach 40% or more. It is very expensive, and that's why there is an idea to create a launch vehicle, which, like an airliner, would take off from a cosmodrome, reach orbit and, having deployed a satellite or spacecraft there, would return to the cosmodrome. The first attempt of implementing this idea was the creation of the Space Shuttle system. Based on the analysis of shortfalls of expendable launch vehicles and the Space Shuttle system, performed by Konstantin Feoktistov (K. Feoktistov. Trajectory of Life. Published by Vagrius in 2000. Moscow. ISBN 5-264-00383-1. Chapter 8. Rocket like an airplane), one gets an idea of qualities of a good launch vehicle which provides delivery of payload into orbit at minimum cost and maximum reliability. It should be reusable system capable to perform 100-1000 flights. Reusability is needed both for reducing costs per flight (development and manufacturing costs are amortized over a number of flights), and for improving the payload orbit insertion reliability: each ride in a car or flight in an aircraft confirm the correctness of its design and quality of manufacturing. Hence, the costs of insurance for payload and launch vehicle can be reduced. Only reusable machines can be truly reliable and inexpensive in terms of ownership, such as steam locomotive, car, aircraft. No assembly costs for single-stage vehicle. No need to allocate impact zones on the ground for first stage landings, and therefore no need to pay fees for excluding the land from economy. No need to pay for the delivery of first stages to a launch site. Fueling the multi-stage rocket requires more complicated technology, more time. Assembly of the stack and delivery of stages to a launch site are not amenable to elementary automation and therefore require a large number of specialists during preparation for another flight. The launch vehicle must use oxygen and hydrogen as propellants, and their combustion yields environmentally friendly products and high specific impulse. Environmental friendliness is important not only for launch site operations, during fueling, in case of an accident, but not least to avoid the harmful effects of combustion products on the ozone layer of the atmosphere. Skylon, DC-X, Lockheed Martin X-33 and Roton are among the most mature projects of single-stage space vehicles outside Russia. 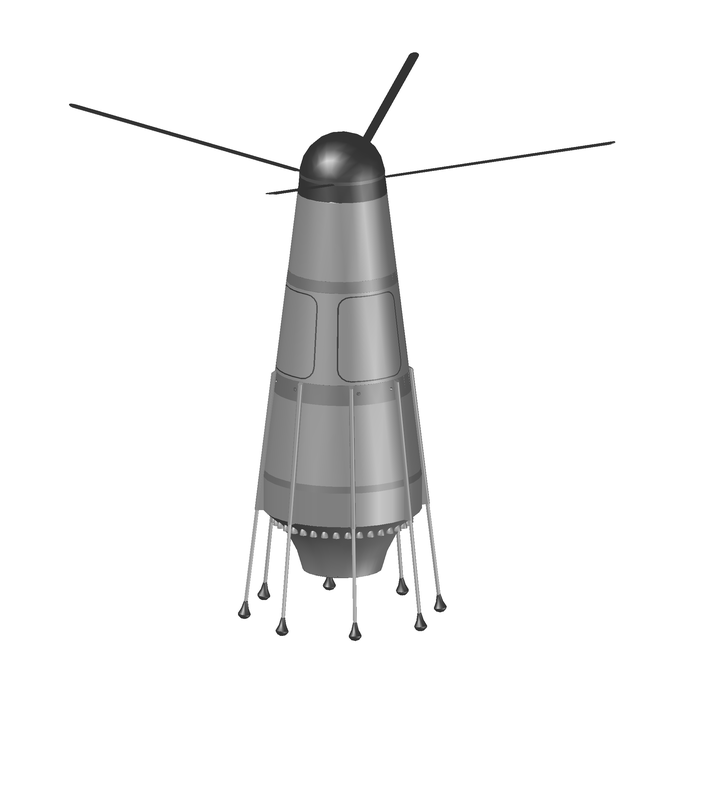 While Skylon and X-33 are winged designs, DC-X and Roton are vertical takeoff, vertical landing vehicles. Besides, they both reached the phase of creating test vehicles. While Roton had only atmospheric prototype for testing autorotative descent and landing, DC-X prototype completed several flights to an altitude of several kilometers with liquid propellant rocket engine burning liquid oxygen and hydrogen. To drastically reduce the cost of launching payloads into space Lin Industrial proposes to create Zeya launch vehicle. It is a single-stage reusable transport system with vertical takeoff, vertical landing. It uses environmentally friendly and highly efficient propellants: oxidizer - liquid oxygen, fuel - liquid hydrogen. The launch vehicle consists of oxidizer tank (above which thermal protection shield for atmospheric reentry and rotor of soft landing system are located), payload compartment, instrumentation compartment, fuel tank, tail section with powerplant and landing gear. Conical segment shaped tanks for oxidizer and fuel are load-bearing, composite. Fuel tank is self-pressurized by liquid hydrogen vapor, while oxidizer tank is pressurized by compressed helium from high pressure tanks. Main powerplant consists of 36 engines placed circumferentially and aerospike nozzle as a central body. During the main powerplant operation pitch and yaw control is performed by throttling diametrically opposed engines, roll control - using eight thrusters, powered by gaseous propellants, located under the payload compartment. For flight control in orbit thrusters powered by gaseous propellants are used. Zeya flight profile is as follows. 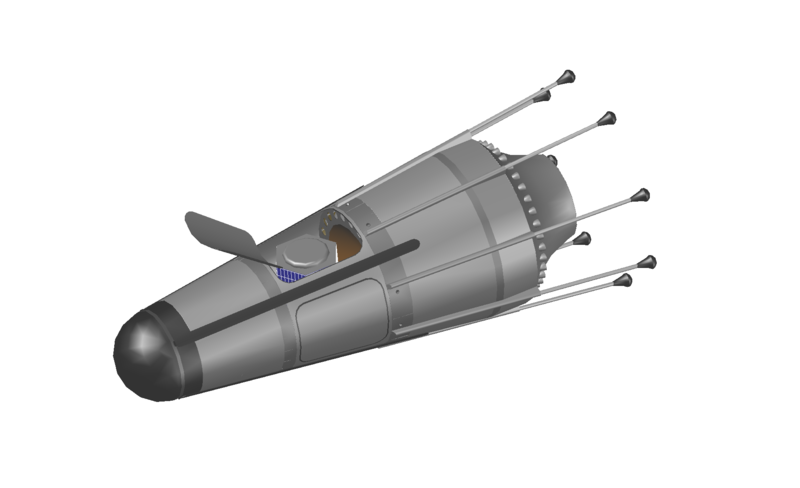 After parking orbit insertion, the launch vehicle, if necessary, performs orbital maneuvers to enter final orbit, and after that, having opened its payload compartment, releases the payload (with mass of up to 200 kg). Having performed a deorbit burn during a single orbit around the Earth since launch, Zeya lands in the region of its launch site. High landing accuracy is ensured by using aerodynamic efficiency of the vehicle's shape for making turns and range control maneuvers. Soft landing is performed through autorotative descent and eight landing shock absorbers. According to our estimates, the cost of one launch will be €0.15 mln, while the cost of maintenance between flights and indirect costs - about €0.1 mln for each period between flights. If the launch price is set at €35 thousands per kg (and the cost is €1250/kg), being close to the price of launch on Dnepr vehicle for foreign customers, then the entire launch (200 kg of payload) will cost the customer €7 mln. Thus, the project will pay for itself within 47 launches. Another way to improve the efficiency of single-stage launch vehicle is the use of tripropellant liquid rocket engines. Since early 1970s in the USSR and the USA was studied the concept of tripropellant engines, which would combine high specific impulse when using hydrogen as fuel, and higher average propellant density (and, therefore, less volume and mass of propellant tanks) characteristic of hydrocarbon fuel. After ignition such an engine would burn liquid oxygen and kerosene, and at high altitudes have switched to burning liquid oxygen and hydrogen. Such an approach might help to create a single-stage space launch vehicle. In Russia RD-701, RD-704 and RD-0750 tripropellant engines have been developed, though they did not reach the phase of test samples creation. In 1980s NPO Molniya have developed the Multipurpose aerospace system (MAKS) based on RD-701 engine burning oxygen + kerosene + hydrogen. Calculations and design of tripropellant engines were held in America as well (see, for example, Dual-Fuel Propulsion: Why it Works, Possible Engines, and Results of Vehicle Studies by James A. Martin & Alan W. Wilhite, published in May 1979 in American Institute of Aeronautics and Astronautics (AIAA) Paper No. 79-0878). Zeya uses liquid oxygen boiling at -183 Celsius as oxidizer, that means cryogenic equipment is used anyway for the launch vehicle and fueling infrastructure, and thus there will not be fundamental difficulties in replacing kerosene tank with tank for methane at -162 Celsius. Methane efficiency is superior to kerosene. Specific impulse (Isp, a measure of efficiency of rocket engines - generated thrust divided by the propellant flow rate) of methane + liquid oxygen combination is higher than Isp for kerosene + liquid oxygen combination by about 100 m/s. Methane is cheaper than kerosene. Unlike kerosene engines, methane engines are almost free of coking, that is, in other words, the formation of stubborn residue of carbon. And thus, such engines are more appropriate for reusable systems. If necessary, the methane can be replaced with liquefied natural gas (LNG) having similar specifications. LNG consists almost entirely of methane, has similar physical and chemical characteristics and is slightly less efficient than pure methane. And LNG is 1.5-2 times cheaper than kerosene and much more available. The point is that Russia is covered by an extensive network of natural gas pipelines. Branching a pipeline toward cosmodrome and building a small liquefaction facility is enough. Besides, an LNG plant is built on Sakhalin island in Russia, as well as two small-scale liquefaction plants in Saint-Petersburg. Five more plants are to be built at different locations in Russia. At the same time the production of rocket-grade kerosene requires special grades of petroleum extracted from specific petroleum reservoirs, which are gradually exhausted in Russia. Burning sequence for tripropellant vehicle is as follows. Methane is burned first - high density fuel with relatively small specific impulse in a vacuum. Then hydrogen is burned - fuel with low density and the highest specific impulse. Both types of fuel are burned in the same engine. The higher the share of fuel of the first type, the smaller mass of the structure, but the greater mass of fuel. Accordingly, the higher the share of fuel of the second type, the smaller mass of necessary fuel, but the greater mass of the structure. Consequently, an optimal liquid methane to hydrogen mass ratio can be found. We performed the appropriate calculations, taking fuel compartment factor equal to 0.1 for hydrogen, and 0.05 for methane. Fuel compartment factor is the final mass of fuel compartment divided by the initial mass of fuel. 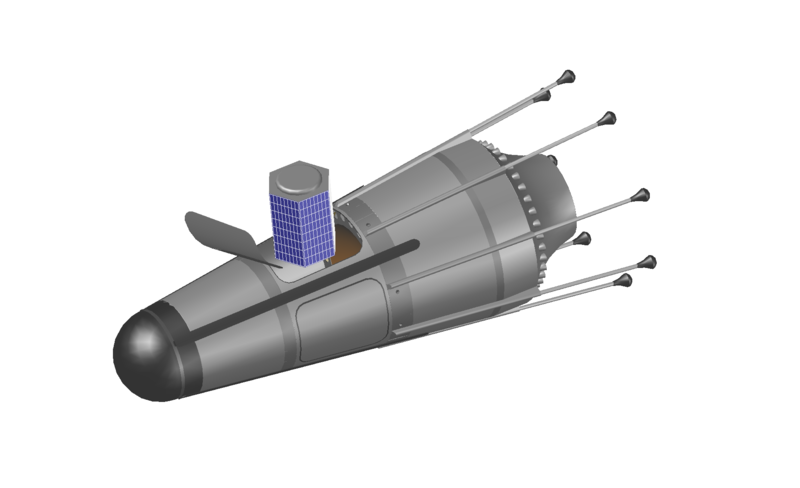 The final mass of fuel compartment includes the mass of reserve fuel, non-consumable remaining propellants and pressurizing gases. Calculations show that tripropellant version of Zeya will launch 200 kg of payload into low Earth orbit having vehicle dry mass of 2.1 t and launch mass of 19.2 t. Bipropellant version of Zeya with liquid hydrogen loses much: dry mass - 4.8 t, launch mass - 37.8 t.